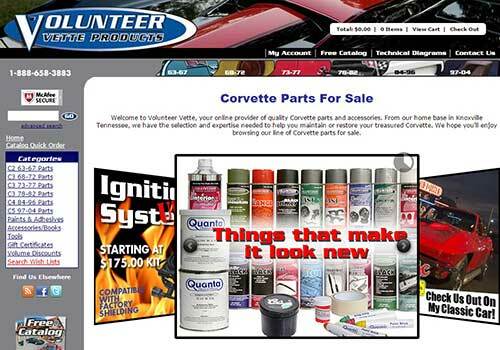 Volunteer Vette is a Corvette parts supplier located in Tennessee. One of our oldest clients, they’ve been working with us for more than a decade. 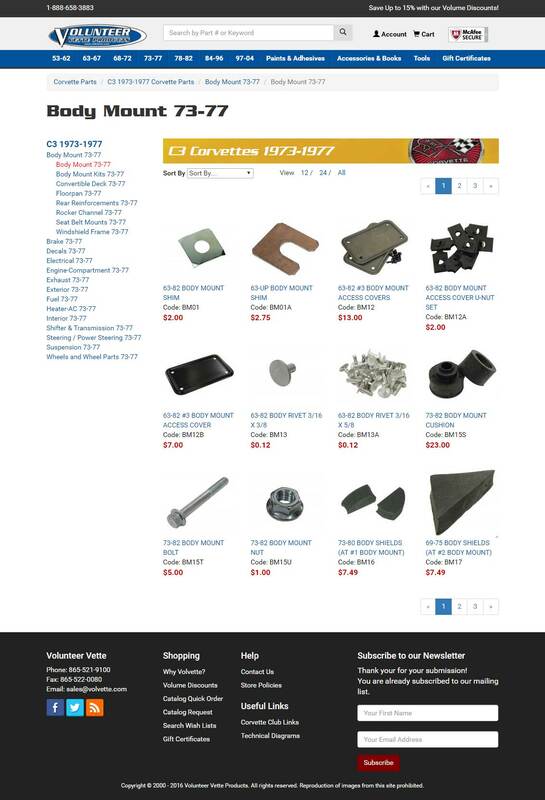 But in 2016, we agreed that their store needed a fresh look and feel that stayed true to their online and offline brand, while performing well on phones and tablets as well as traditional computers. 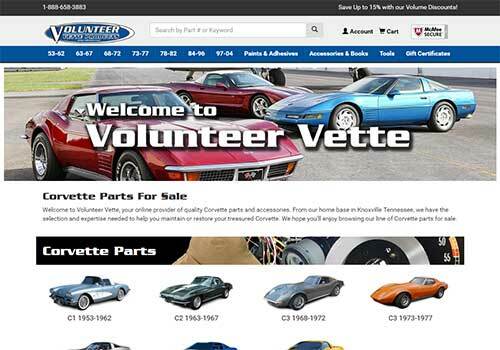 Volvette.com has been using MIVA Merchant for their shopping cart and catalog for many years. As a result, their site was using an older user interface module called MMUI, or MIVA Merchant User Interface, that MIVA had declared obsolete a few years ago. 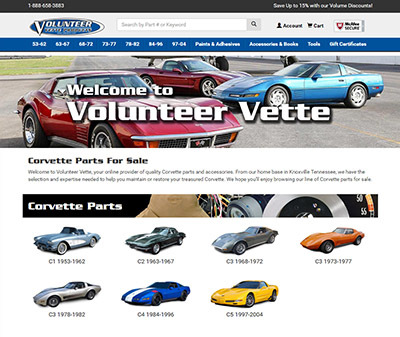 New features are only supported by CSSUI (CSS User Interface), so our first step was to convert Volvette’s site from MMUI to CSSUI. That conversion process completely wipes out the previous look and feel, so we imported our Bootstrap-based MIVA Merchant framework as a starting point for the website. 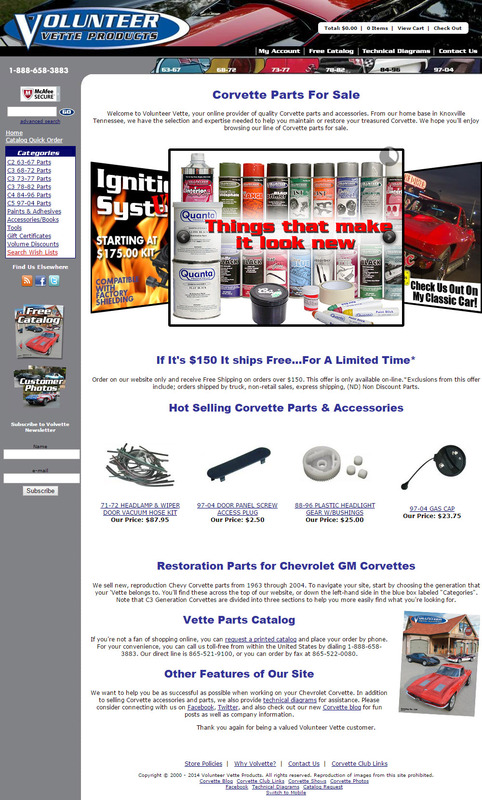 From their, we customized the site with gorgeous photographs of classic and modern Corvettes, unique typography to support the Volvette brand, and a layout that supports their deep category structure designed to help customers find the right parts for their particular Corvette model. A custom mega-dropdown menu provides easy desktop navigation, while collapsing efficiently on mobile devices. 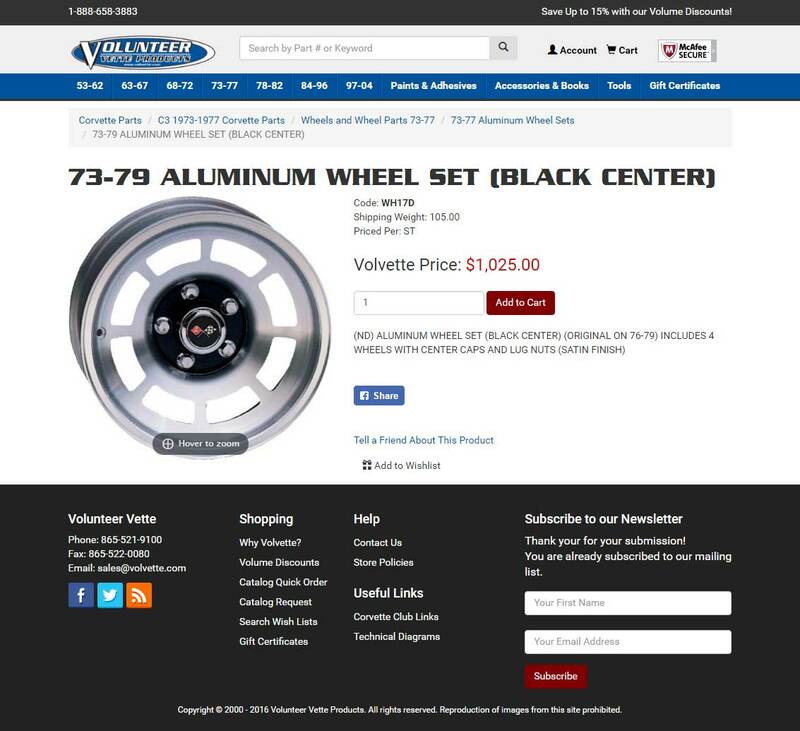 Discounts and Pricing: Volvette has a unique discount model where customers can qualify for 5%, 10% and 15% discounts based on order volume. Some discount levels are one-time use, while others last a lifetime and need to be permanently applied to a customer’s account. 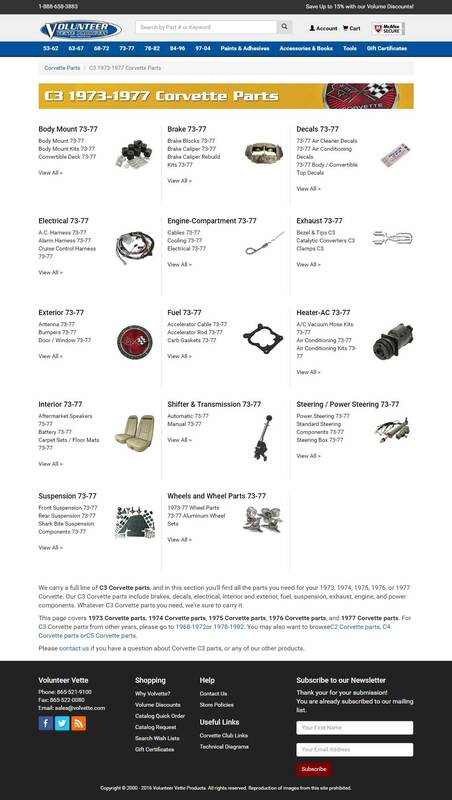 The site also has to support unique pricing for different levels of professionals. We developed a custom solution using MivaScript to handle both the retail percent discounts and the professional special pricing. 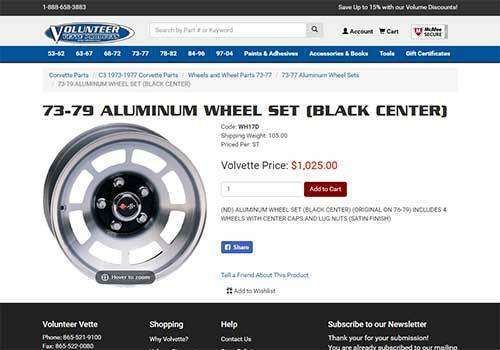 The module supports all of Volvette’s pricing and discount requirements without requiring manual intervention. 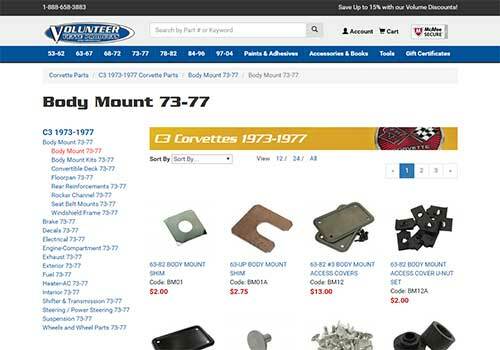 Customer Wishlists: They also wanted to implement a wishlist as part of the redesign. 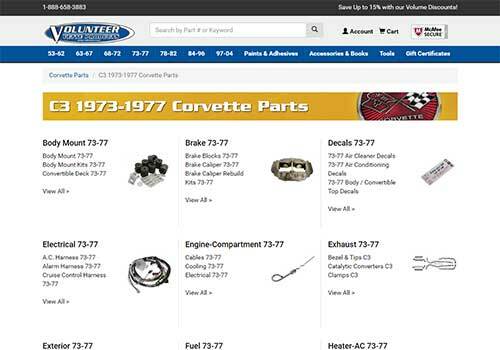 Corvette enthusiasts often work for months or years to restore a car, so it’s helpful for them to have a place to track items they may want to purchase in the future or to ask for as a gift from friends and family. Registered account holders can use MIVA’s built-in wishlist feature to save those items they are interested in buying and to share their lists with friends. One Page Checkout: Finally, the one-page checkout that had previously been implemented by MIVA’s developers had to be updated for the new templates. The one-page checkout replaces MIVA’s normal 4-step checkout with a single page that relies on AJAX and custom templates to handle all the processing on a single page. Some selected screenshots from this project are shown below. Click any thumbnail to see a larger version.